Yahsat, the UAE’s leading global satellite operator, together with Thuraya, the mobile satellite services subsidiary of Yahsat, will showcase the latest government and military satellite communication technologies at this year’s International Defence Exhibition and Conference (IDEX). During the five-day exhibition, Yahsat Government Solutions and Thuraya will unveil nine new solutions that provide robust, secure and integrated satellite connectivity. The technologies form part of Yahsat’s wider offering, featuring a diverse ecosystem of integrated satellite solutions designed to meet the most complex security requirements of governments and defense clients. 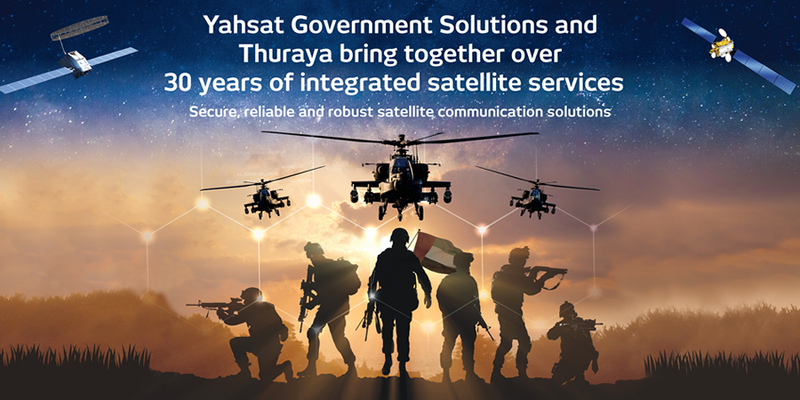 These new Yahsat Government Solutions offerings build upon Yahsat’s and Thuraya’s experience in operating satellite communication services for over 30 years. Today, Yahsat Government Solutions provides the UAE armed forces with secure, reliable and robust connectivity in land, sea and air platforms. Following the acquisition, Thuraya’s two satellites, which serve over 160 countries, joined Yahsat’s existing network to expand the group’s total fleet to five satellites. As a result of the larger fleet, Yahsat Government Solutions’ service portfolio now has the potential to reach a wider breadth of markets through a combination of geostationary satellites operating in the C, Ka, Ku and L-bands. Together, they cover Europe, Africa, the Middle East, South America, Australia and Asia.